Yankee Boy Basin is a perennial favorite destination, known for its wildflowers in late July and August, as the trailhead for climbing Mt. 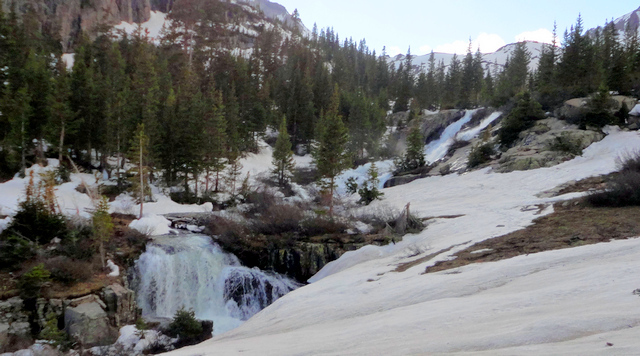 Sneffels, the iconic Twin Falls, and stunning scenery. 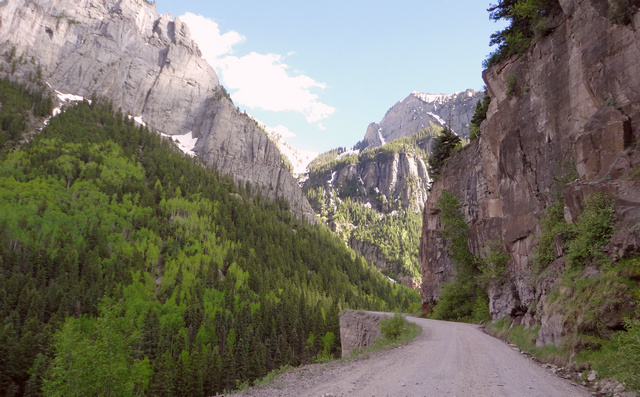 It’s easy to get to from Ouray, but you’ll need 4WD, an ATV, or a dirt-bike motorcycle to do it. The photo below, taken on June 14, 2011, shows some dramatic scenery, and below that are directions to get there from Ouray, Colorado. Yankee Boy Basin from the spot on the GPS map marked Pin 1. The view is to the east. Now, for detailed directions. This post has a GPS map plus lost of photos, so if you’re using a mobile device, please be patient. I tried to make the photos as small as I could and preserve quality. First, the GPS map. The starting point, at the upper right hand corner, is downtown Ouray, Colorado. GPS track from Ouray to Yankee Boy Basin. The out-and-back tracks coincide sufficiently that I think this is a pretty accurate track. Start at Ouray, at the upper right hand corner. Look for this sign. 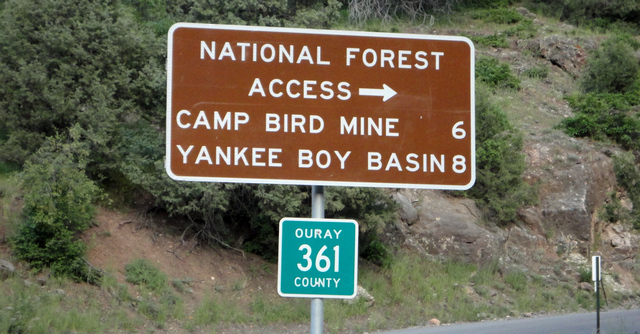 It's Ouray County Road 361 and is called Camp Bird Road. You’ll travel up this road for quite awhile. The lower part of the road travels through a residential area: please observe speed limits and the amount of dust you raise. If you have ATVs or non-street-legal dirt bikes, note there is no parking. You should drive up the road a couple miles to the first bridge across the river—lots of parking there, but observe the signs. You’ll be traveling on some shelf roads, as shown in the picture below. View from Ouray County Rd 361, Camp Bird Road. Yes, that's the road in front of you. No guard rails, either. This is a good time to remind you that the only person responsible for your safety is you, and you alone. There aren’t any guard rails and the corners aren’t marked. I suggest you not try this road after dark. Vehicles traveling uphill have the right of way and there are spots where two vehicles cannot pass each other. Use common sense. If you want to take a picture, pull your vehicle over where it’s out of the way, get out, and take your pics. Do not block the road—it’s heavily used in the summer and early autumn. When you get to the Camp Bird cutoff (which is the way you'd travel to Imogene Pass), note this little sign way over on the right. Bear right and follow the rather steep road up. Once you get to Camp Bird (a rather huge old mining operation), bear right onto Ouray County Road 26. The road gets rough and steep, and will get rougher as you go. Now for one of the most interesting and photographed features: the overhang! Overhang over Ouray County Road 26. This picture is taken from the southwest looking back. Notice that the huge rock looms completely over the road. And, if you look closely in the very center of the photo, there's a waterfall. The water just runs down the road. Don’t try to avoid the water here—the road is plenty sturdy even when covered with water. From here you continue on the road. Note that there are some little side roads that tend to wander off the main road. Most of these are short and go to various mining remains. Be careful as these roads can get very steep in a hurry. Note the emergency call box at the intersection of Ouray County Road 26 and the old (note the OLD) cutoff to Imogene. Bear right as you pass this. BTW, that's the only emergency call box on the entire route. From here the road gets quite steep and rough. If you are in a Jeep or pickup truck, there are times when you want to put a wheel on the obstacle rather than let it rip off your oil pan! ATVs and motorcycles should have no problem, but note there is moderate scree and a number of places where water runs across the road. The road (as of last Tuesday, and I have no reason to believe things have changed) is cleared as far as the Forest Service bathroom. Yankee Boy Basin Forest Service bathroom. For whatever reason, this has become the reference point to directions in and about Yankee Boy Basin. Many people who hike to the top of Mt. Sneffels prefer to park here and walk. The road goes further but is exceptionally rough. The bathroom (fully functional) is “ground zero” as a reference point for everything in Yankee Boy Basin. Actually, I like the views a hundred yards or so back down the road where you see the red pin on the GPS map. There’s a parking area. In late July and through August this is ablaze with wildflowers including Colorado’s state flower, the columbine. You can also walk easily to the iconic twin falls. As of last Tuesday, the area is still mostly snow-blanketed, but that will change. The photo below shows the snow beyond the bathroom. This is where the snowplow stopped, and shows the view as of Tuesday, June 14th. 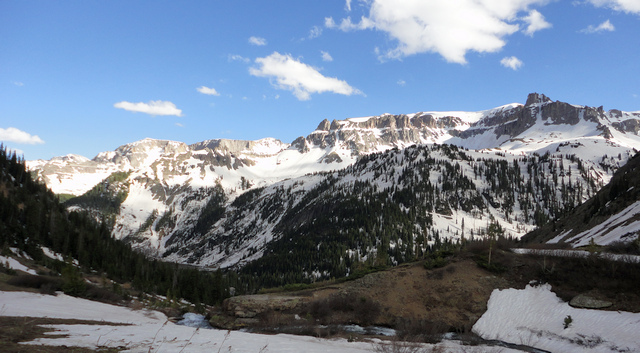 People don’t travel to Yankee Boy Basin for the road, but rather to see the scenery. The picture at the very top of this post looks east from Pin 1 on the map, which is where you park for Twin Falls. There are several waterfalls, depending on how far you want to hike around. The iconic twin falls are at the upper right and an equally spectacular lower falls is in the lower left. Be careful. There are no guard rails. Safety, safety, safety! There are no guard rails, nor is there anyone close at hand to help. But, if you’re careful, you’ll find some incredible views! 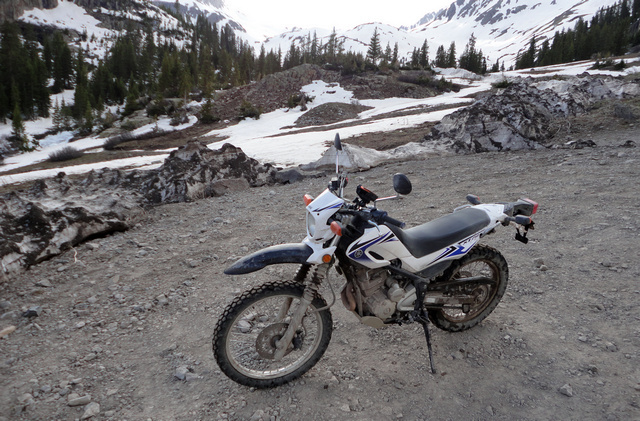 As a last photo, I show my trusty Yamaha XT-250 with Twin Falls in the background. My Yamaha XT-250 in the parking area, with Twin Falls in the background. 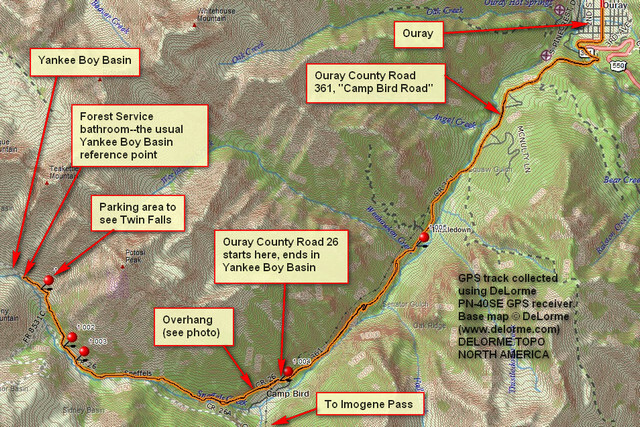 This entry was posted in GPS Tracks, Motorcycling, Ouray County and tagged Camp Bird Road, Ouray Colorado, Ouray County Road 26, Ouray County Road 361, Yankee Boy Basin. Bookmark the permalink. 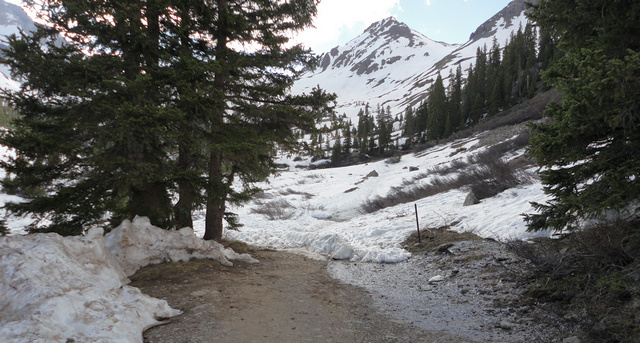 If you’re careful, you should be able to get to Yankee Boy Basin. There are a few rough spots toward the end. However, don’t attempt Imogene Pass in the Subaru, nor the road to Engineer Pass (Ouray CR 18), and I recommend strongly against trying Corkscrew, Hurricane, Cimarron, Engineer, or California passes. You can, however, drive US Hwy 550 to Silverton (note: there is ongoing road construction) and then from there drive up to Animas Forks ghost town. You can certainly drive over Owl Creek Pass. Usually Ophir Pass is approachable fairly easily. Can I get up to the higher trailhead in a Subaru Outback if I’m really careful? Is the risk a flat tire or losing an oil pan or something like that? Or is the risk getting stuck? Thanks!